Karen and Mike from Pittsburgh, Pennyslvania used CM26JE in their dinning room. Here is what they had to say, “we added the medallion to enhance the room’s lighting fixture and make more of a statement over the table. 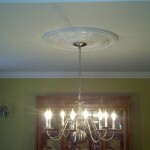 We used caulking and the cover on the light fixture to hold it up. Prior to hanging the medallion I painted it to match my crown molding and trim. 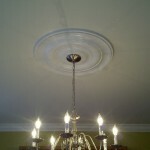 Small price for the huge impact it made on our dinning room.” For more information on ceiling medallions, visit us at www.architecturaldepot.com/ceiling-medallions.html.